Nucleosome, a fundamental unit of chromatin, is made up of 147 bp of DNA wrapped a histone octamer. Histone octamer is formed by two copies each of the four core histones, H2A, H2B, H3, and H4. Although the major functional role of histones is DNA compaction, recent evidence has bought to light that through modulation of the interaction between histones and DNA many cellular processes are governed. This modulation is largely brought about by a repertoire of posttranslational modifications occurring on N-terminal tails of histones. However, histone variants the nonallelic subtypes of canonical histones are also known to modulate the chromatin dynamics and thus influencing the activity of the underlying DNA. Canonical histone genes are organized into clusters containing multiple gene copies of each core as well as linker histones. In humans, three copies of genes encoding H3.2 are located within a histone cluster on chromosome 1, and ten copies of genes encoding H3.1 are clustered in the chromosome 6. These canonical H3-encoding genes are intronless, and their corresponding transcripts are not polyadenylated but rather have a conserved 26 bp stem-loop at their 3' ends. The tandem organization of histone genes facilitates their simultaneous expression, thus aiding in the production of massive amounts of histone protein required for genome packaging during S phase. In contrast to the canonical histone H3, histone variant H3.3 genes, namely, H3F3A and H3F3B in humans, lie outside the histone gene clusters on chromosomes 1 and 17 respectively [Figure 1]a. They contain introns, and their mRNAs have poly (A) tails. Unlike canonical H3 which is expressed and incorporated into chromatin at S phase in a replication-dependent manner, variant H3.3 is expressed throughout the cell cycle. In yeast, there is only one noncentromeric H3 gene, which encodes an H3.3-like protein, suggesting that H3.3 is more conserved than its canonical counterparts. At the protein level, H3.3 differs from the canonical histone H3 at only 4-5 amino acids [Figure 1]b. In humans, H3.3 and H3 differ by residues 87, 89, 90, and 96 in the histone fold domain and residue 31 in the N-terminal tail. All these specific residues contribute to the distinct properties of variant H3.3. Amino acid residues 87–90 in H3.1-SAVM are replaced by AAIG in H3.3. These changes determine their unique deposition onto chromatin. At the N-terminus, Ala 31 in H3.1 is replaced by Ser in H3.3, which undergoes phosphorylation in the pericentromeric region during mitosis. 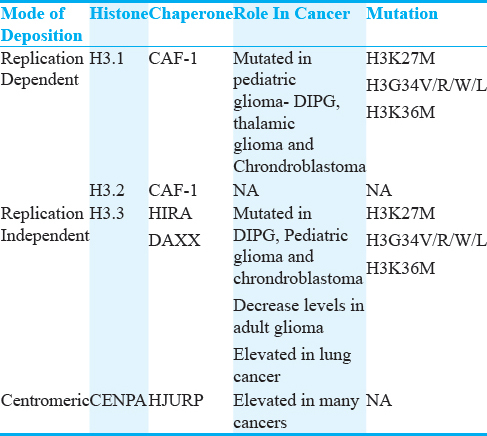 Incorporation of canonical H3 variants is mediated by the “histone chaperone” CAF-1 chromatin assembly complex, and H3.3 is incorporated through a number of different pathways, including the CHD1 and ATRX chromatin remodeling complexes and the HIRA chaperone complex. Ala 87 and Gly 90 in AAIG are important for the recognition of H3.3 by the variant-specific chaperone death domain–associated protein (DAXX), and G90 is also recognized by ubinuclein-1, a subunit of the HIRA histone chaperone complex. A study with mouse embryonic stem (ES) cells showed that the HIRA complex deposits H3.3 on transcribed genes, while the ATRX complex delivers H3.3 to telomeres and pericentromeric repeats. When incorporated into a nucleosome, H3.3 amasses modifications associated with gene activation or open chromatin – including methylation on K4, K36, and K79 and acetylation on K9 and K14 – and is deprived of suppressive modifications, including K9 and K27 methylations. H3.3-containing nucleosomes are intrinsically unstable and promote gene activation, especially along with histone H2A.Z incorporation. H3.3 is highly conserved across metazoans, and its in vivo function has been studied in a number of different model organisms. In Drosophila, H3.3 is required only for fertility but is dispensable for both embryonic and postnatal. The fertility defects in H3.3-null flies can be rescued by ectopic expression of H3.2. In Xenopus, HIRA-dependent H3.3 depositions are required for early gastrulation and mesodermal marker gene activation, and importantly, H3.2 overexpression cannot rescue the mutant phenotype. H3.3 maintains the somatic epigenetic memory in nuclear transferred Xenopus nuclei and supports differentiation of cultured murine muscle precursor cells. In zebrafish, reduced levels of H3.3 in the nuclei leads to defects in cranial neural crest cell differentiation. H3f3b knockout mice also have reduced viability, and surviving adults are infertile. In both ES cells and mouse embryonic fibroblasts, H3.3 loss caused a dramatic increase of mitotic defects indicative of chromosome structure dysfunctions, including anaphase bridges and lagging chromosomes. Cells in which H3.3 has been knocked down are also susceptible to DNA damage. This can be explained by the requirement for H3.3 in a gap-filling mechanism to ensure nucleosome replacement in transcriptionally active areas. H3.3 is incorporated at sites of ultraviolet (UV) damage, it protects against sensitivity to UV light and is required to maintain replication fork progression after UV damage. H3.3 may also be important for the restart of transcription following DNA damage since knock down of the H3.3 chaperone HIRA resulted in an impaired recovery of RNA synthesis after UVC damage. Thus, HIRA-dependent incorporation of H3.3 is required for the reprogramming of nuclear transferred murine nuclei, transcriptional recovery after genomic DNA damage in human cancer cell lines, and also for polycomb-repressive complex 2 recruitment to bivalent loci in mouse ES cells. Furthermore, somatic mutations in H3.3-encoding genes cause various types of cancer in humans, underscoring its role in maintaining tissue homeostasis. With the aid of deep sequencing techniques, more and more mutations are being found in various chromatin-associated factors including histones. Histone H3 is found to be mutated at high frequency in several specific cancer types like pediatric high-grade glioblastoma (HGG), chondroblastoma and giant cell tumors of the bone., The identified missense mutations K27M, G34V/R/W/L, and K36M were found predominantly in the genes encoding H3.3, H3F3A, and H3F3B, and to a lesser extent in H3.1 genes, HIST1H3B and HIST1H3C. Due to such specificity and high frequency of these mutations they are defined as “Driver mutations” for tumorigenesis. Somatic mutation of H3 lysine 27 to methionine (K27M) was seen in ~30% pediatric HGG tumors. The K27M mutation is most often found in H3F3A (>70%) with a few occurrences in HIST1H3B (~20%) and HIST1H3C. Diffuse intrinsic pontine glioma, a tumor of the pons, has an even higher incidence of K27M, with >70% of tumors sequenced containing the mutation and are particularly deadly, with an approximate age of onset of 8 years and overall survival rates of ~10% postdiagnosis., Sequencing of H3F3A and H3F3B in more than seventy chrondroblastomas revealed nearly 95% of the tumors harbor lysine 36 to methionine (K36M) substitutions, which mutate the target site for SETD2 and other K36 methyltransferases. Unlike the K27M mutation of glioblastoma, nearly all of the K36M mutations were found in H3F3B (~90%) rather than in H3F3A. Interestingly, histone H3K36Me3 methyltransferase, SETD2 mutations, and H3.3 mutations are mutually exclusive. Giant cell tumors of the bone also have shown a high frequency of H3.3 mutations, with >90% of tumors sequenced containing substitutions of G34 to either tryptophan (G34W) or, in rare cases, leucine (G34 L). Mutations of H3.3 were also observed at low frequency in osteosarcoma (2% containing G34R in H3F3A or H3F3B), conventional chondrosarcoma (1% containing K36M in H3F3A), and clear cell chondrosarcoma (7% containing K36M in H3F3B). Interestingly, although highly prevalent in pediatric glioblastoma, to date, no K27M mutations have been observed in bone or cartilage tumors, and the K36M mutation has not been found in glioblastoma. The occurrence of K27M, a dominant negative mutation leads to loss of H3K27Me3, a repressive mark and gain in H3K27Ac, an active enhancer associated mark thus leading to the activation of previously silenced genes and thus contributing to tumorigenesis. Nucleosomes harboring either a G34R or G34V mutant H3.3 exhibit reduced H3K36Me2/Me3 levels on the same tail, but have no dominant effect on total cellular H3K36Me2/Me3 levels, however, it is linked to an altered transcriptional status of the cells, with quite widespread changes in RNA polymerase II association. Chicken lymphoma DT40 cells either depleted for histone H3.3 or harboring H3.3 with G34R/V mutation are sensitive to UV due to loss of DNA repair mark H3K36Me3. The presence of mutant H3.3 or aberrantly modified H3 proteins (due to dominant effects of K27M or local effects of G34 mutant H3.3) at key regulatory elements may be critical to alteration of transcriptional programs leading to tumor initiation or progression [Figure 2]. Not only mutations but deregulation of H3.3 levels has also been seen in certain cancers. MLL5 mediated decrease in H3.3 expression favors self-renewal properties of adult glioblastoma (glioblastoma multiforme [GBM]) cells and phenocopies pediatric GBM with H3.3 mutations, indicating potential therapeutic strategies for adult GBM. Furthermore, a recent study has highlighted overexpression H3.3 is associated with lung cancer progression and promotes lung cancer cell migration by activating metastasis-related genes through the occupation of intronic regions. Histone H3 clipping has been observed in many cellular systems such as embryonic stem cells (hESCs), senescent fibroblasts, melanocytes, and hepatocytes. Analysis of the proteolytic clipping of histone H3 during the differentiation of hESCs revealed that the N-terminal tail of H3 can be cleaved at different sites and is mediated by a serine protease. Notably, it has been suggested that cleaved products of H3 could contribute to regulate genes implicated in cell cycle promotion, DNA replication, cellular proliferation, apoptosis, and migration in senescence. Furthermore, a recent report claims a reduction in H3 clipping activity in cervical cancer cells. However, what still remains a mystery is does this clipping activity has any variant specificity and what are the molecular mechanism through which they mediate oncogenesis. H3.3 is incorporated into promoters of developmentally regulated genes, and these loci bear both H3K27Me3 and H3K4Me3 marks, marking these promoters as bivalent domains poised for transcriptional induction. H3.3 is required for the establishment of the H3K27Me3 mark in these domains and it is easy to envisage that a switch to K27Ac or possibly K36Me3 either by recruitment of mutated H3.3 or global decrease in H3.3 may tip the balance to activation of aberrant developmental programs leading to tumorigenesis. Cancer epigenome as a target for better clinical management gives hope to us all, but more research is required to reveal exciting aspects in coming years. The deposition of H3.3 by HIRA is considered as a mark of transcriptional activity, and its deposition by DAXX at telomeric and a pericentromeric region marks heterochromatin state. Therefore, H3.3 has a bimodal functional role depending on the context, i.e., chromosomal location/chromatin environment. Conclusively, it can be said that H3.3 is a focal point of convergence for most of the epigenomic regulations in various cellular processes. Hence, it does not come as a surprise that H3.3 is mutated or deregulated in a disease like cancer. However, more in-depth analysis is required before they can be used as a new diagnostic and therapeutic target for cancer. All Gupta Laboratory members for valuable discussions. Luger K, Mäder AW, Richmond RK, Sargent DF, Richmond TJ. Crystal structure of the nucleosome core particle at 2.8 A resolution. Nature 1997;389:251-60. Hake SB, Allis CD. Histone H3 variants and their potential role in indexing mammalian genomes: The “H3 barcode hypothesis”. Proc Natl Acad Sci U S A 2006;103:6428-35. Weber CM, Henikoff S. Histone variants: Dynamic punctuation in transcription. Genes Dev 2014;28:672-82. Whitfield ML, Zheng LX, Baldwin A, Ohta T, Hurt MM, Marzluff WF. Stem-loop binding protein, the protein that binds the 3' end of histone mRNA, is cell cycle regulated by both translational and posttranslational mechanisms. Mol Cell Biol 2000;20:4188-98. Ahmad K, Henikoff S. The histone variant H3.3 marks active chromatin by replication-independent nucleosome assembly. Mol Cell 2002;9:1191-200. Hake SB, Garcia BA, Kauer M, Baker SP, Shabanowitz J, Hunt DF, et al. Serine 31 phosphorylation of histone variant H3.3 is specific to regions bordering centromeres in metaphase chromosomes. Proc Natl Acad Sci U S A 2005;102:6344-9. Elasaesser SJ, Allis CD. Atp-dependent. HIRA and Daxxconstitute two independent histone H3.3-containingpredeposition complexes. Cold Spring Harb Symp Quant Biol2010;978-1936113-07-1. Wong LH, McGhie JD, Sim M, Anderson MA, Ahn S, Hannan RD, et al. ATRX interacts with H3.3 in maintaining telomere structural integrity in pluripotent embryonic stem cells. Genome Res 2010;20:351-60. Filipescu D, Müller S, Almouzni G. Histone H3 variants and their chaperones during development and disease: Contributing to epigenetic control. Annu Rev Cell Dev Biol 2014;30:615-46. Jin C, Felsenfeld G. Nucleosome stability mediated by histone variants H3.3 and H2A.Z. Genes Dev 2007;21:1519-29. Wen D, Banaszynski LA, Liu Y, Geng F, Noh KM, Xiang J, et al. Histone variant H3.3 is an essential maternal factor for oocyte reprogramming. Proc Natl Acad Sci U S A 2014;111:7325-30. Loppin B, Bonnefoy E, Anselme C, Laurençon A, Karr TL, Couble P. The histone H3.3 chaperone HIRA is essential for chromatin assembly in the male pronucleus. Nature 2005;437:1386-90. Yuen BT, Bush KM, Barrilleaux BL, Cotterman R, Knoepfler PS. Histone H3.3 regulates dynamic chromatin states during spermatogenesis. Development 2014;141:3483-94. Jang CW, Shibata Y, Starmer J, Yee D, Magnuson T. Histone H3.3 maintains genome integrity during mammalian development. Genes Dev 2015;29:1377-92. Ray-Gallet D, Woolfe A, Vassias I, Pellentz C, Lacoste N, Puri A, et al. Dynamics of histone H3 deposition in vivo reveal a nucleosome gap-filling mechanism for H3.3 to maintain chromatin integrity. Mol Cell 2011;44:928-41. Frey A, Listovsky T, Guilbaud G, Sarkies P, Sale JE. Histone H3.3 is required to maintain replication fork progression after UV damage. Curr Biol 2014;24:2195-201. Adam S, Polo SE, Almouzni G. Transcription recovery after DNA damage requires chromatin priming by the H3.3 histone chaperone HIRA. Cell 2013;155:94-106. Banaszynski, Wen D, Dewell S, Whitcomb S, Lin M, Diaz N, Elsasser S et al. Hira dependent histone H3.3 deposition facilitates PRC2 recruitment at developmental loci in ES cells. Cell 2013;155, 107-120. Lu C, Jain SU, Hoelper D, Bechet D, Molden RC, Ran L, et al. Histone H3K36 mutations promote sarcomagenesis through altered histone methylation landscape. Science, 2016; 352(6287):844-9. Schwartzentruber J, Korshunov A, Liu XY, Jones DT, Pfaff E, Jacob K, et al. 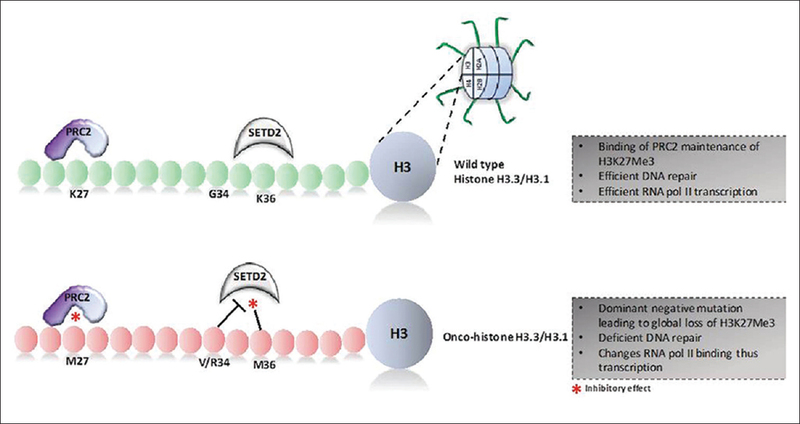 Driver mutations in histone H3.3 and chromatin remodelling genes in paediatric glioblastoma. Nature 2012;482:226-31. Chan KM, Fang D, Gan H, Hashizume R, Yu C, Schroeder M, et al. The histone H3.3K27M mutation in pediatric glioma reprograms H3K27 methylation and gene expression. Genes Dev 2013;27:985-90. Behjati S, Tarpey P, Presneau N, Scheipl S, Pillay N, Loo P, et al. Distinct H3F3A and H3F3B driver mutations define chrondroblastoma and giant cell tumor of bone. Nature Genetics,2013;45, 1479-1482. Joseph CG, Hwang H, Jiao Y, Wood LD, Kinde I, et al. Exomic analysis of myxoid liposarcomas, synovial sarcomas and osteosarcomas. 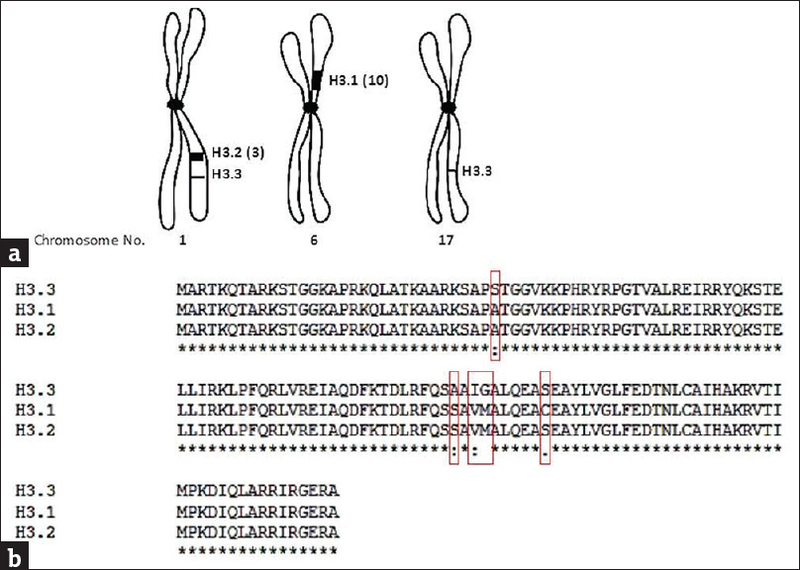 Genes Chromosomes Cancer, 2014;53:15-24. Weinberg DN, Allis CD, Lu C. Oncogenic mechanisms of histone H3 mutations. Cold Spring Harb Perspect Med 2017;7. pii: A026443. Gallo M, Coutinho FJ, Vanner RJ, Gayden T, Mack SC, Murison A, et al. MLL5 orchestrates a cancer self-renewal state by repressing the histone variant H3.3 and globally reorganizing chromatin. Cancer Cell, 2015;28:715-29. Park SM, Choi EY, Bae M, Kim S, Park JB, Yoo H, et al. Histone variant H3F3A promotes lung cancer cell migration through intronic regulation. Nat Commun 2016;7:12914. Santos-Rosa H, Kirmizis A, Nelson C, Bartke T, Saksouk N, Cote J, et al. Histone H3 tail clipping regulates gene expression. Nat Struct Mol Biol 2009;16:17-22. Sandoval-Basilio J, Serafín-Higuera N, Reyes-Hernandez, Serafin-Hiquera I, Leija-Montoya G, Blanco-Morales M, et al. Low proteolytic clipping of histone H3 in cervical cancer. J Cancer 2016;7(13): 1856-1860.